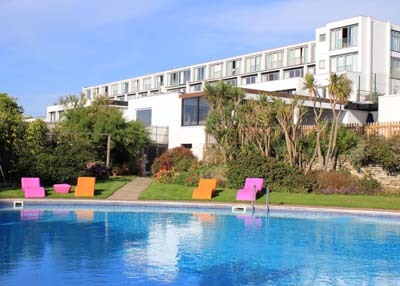 As a lover of the seaside, trains and vintage furniture you can imagine my delight when I discovered that Bedruthan Steps, an award-winning independent hotel in north Cornwall, was hosting weekends away with a difference, in association with Tresithick Upholstery & Restoration. 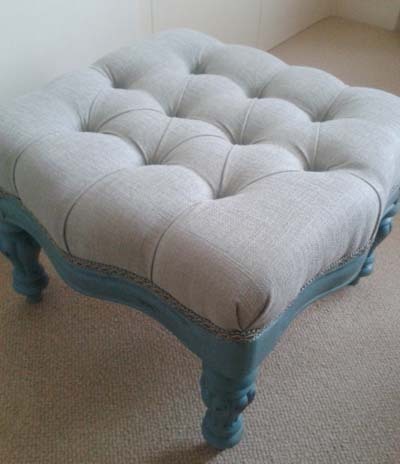 Over the course of two days, participants get to paint, upholster, cover and trim a beautiful wooden footstool, breaking regularly for tea and cake. I had my name down for it faster than you can say ‘deep buttoning’, and a few weeks later I was standing on the platform at Paddington waiting to board the 12:06 to Bodmin Parkway. Toad may have held that a motorcar was the only way to travel, but I’ll take a seat in First Class any day. The route is, to my mind, one of the most scenic on the networkI curled up with my book and watched the waves crashing against the rocks as we passed through Starcross and Dawlish on the Devon coast. Just four hours after leaving London, I was sitting on one of the capacious sofas in Bedruthan’s lounge with fabric swatches and a paint chart on my lap, choosing the colour scheme for my footstool. Assisting me in my decision-making was Sonja, Tresithick Upholstery & Restoration’s co-owner, who deftly steered me away from the Austin Powers-style orange-and-purple combination I was considering towards something much more tasteful. Bedruthan Steps, which stands on the cliffs at Mawgan Porth, near Newquay, opened in 1960. Owners Peter and Mary Whittington ran a right-on boutique in Plymouth, and they were keen to create an equally stylish retreat where parents and children could relax togethera pretty extraordinary concept at the time. They were also ahead of the game in their enthusiasm for locally sourced food. Today, Boden-fresh young families mix happily with couples enjoying a weekend away by the sea. The menus still showcase the best of the West, tooon my first night I enjoyed Cornish pollock and turbot in The Herring restaurant, accompanied by a glass or two of Camel Valley wine. The next morning brought sunshine, so I pottered around on the beach before breakfast. Having made a sizeable dent in the buffet, I headed down to one of Bedruthan’s airy workshops to meet Tresithick’s Richard (Sonja’s husband) and Nadine. My fellow participants and I were presented with our wooden footstool frames, and then it was on with the aprons and out with the brushes as we set to work. We used Annie Sloan Chalk Paint (www.anniesloan.com), which comes in a range of historical colours and can be applied straight to the wood without sandinga godsend for the novice. I plumped for Provence (a deep turquoise) with an undercoat of Aubusson Blue that would be partially revealed by careful sandpapering. I hadn’t painted so much as my nails since I was at school, and I’d forgotten what a joy it is to sit in companionable silence in a sunny room doing. Richard, Sonja and Nadine keep their groups to six or less, so we benefited from masses of attention. After lunch (Cornish-inspired tapas in the hotel’s Wild Café), it was time to fix up the webbing that supports the cushionan arm wrenching process involving a wooden gadget that looked like something Just William might have baited Hubert Lane with. After all that effort, I felt entirely justified in booking myself into Bedruthan’s spa, before tucking into a hearty round of crab sandwiches. The following day was devoted to the cushion: fashioning it from foam, attaching it to the frame and carefully covering it with my chosen fabric (cut by Richard the night before), before creating contrasting buttons and sewing them on, adding the trim and, finally, the dustcloth underneath. I can’t fathom how I’ve survived this long without a button machineoperating it is the purest joy, and I had to be prised away when it was time for lunch. If any readers can point me towards one in London, I will be eternally grateful to them. Watching my footstool start to resemble the demonstration model we’d been shown on the Friday night was tremendously satisfying, and I was having such a happy time in the workshop that I almost missed my train. Sprinting across a footbridge carrying a suitcase, a handbag and a footstool isn’t something I would recommend, but a weekend at Bedruthan most certainly is. Other breaks scheduled for this year include shoe-making (May 10-12), bee-keeping (May 17-19), landscape painting (June 14-16), basket-weaving (September 13-15) and sea-fishing (September 7-9). The next Furniture Painting and Upholstery break at Bedruthan will run from November 15-17, and costs £440 per person, including accommodation, breakfast, lunch, dinner on one night in The Herring and a cocktail at Bedruthan’s sister hotel, The Scarlet (www.scarlethotel.co.uk). First Great Western runs several services each day from London Paddington to Bodmin Parkway.  First Class returns are available from £101.50 and Standard from £52.50.